Because music education has no immediate, short-term, hard-currency profits or products that narrowly educated business people and policymakers can measure—music is often eliminated to make room in the curriculum for math and literacy test prep that’s not “educational,” because standardized test scores are neither valid nor reliable indicators of deep mathematical and literary understanding. Or anything else. The same goes for music education. It’s exceedingly important for music teachers—and NAfME advocates—to keep in mind that “reform” policies were not developed by expert educational researchers. They were initially developed by economists and corporate employees who conceive education as a business; instruction as input, output; students as widgets. These business-based (e.g., Pearson) “educationalists” are not well-educated assessment experts—not even close. Not surprisingly, then, reform policies have done irreparable harm to students, parents, and school systems across the U.S., and to public school music teaching and learning at all levels. As music educators know, the irreparable harm of “reform” includes a national assault on arts education that’s resulted in the elimination of countless excellent school music programs and expert and dedicated music educators. Therefore, as well as advocating for the intrinsic values of music making and listening of all kinds, it’s equally important that music educators join the ranks of thoughtful scholars, teachers, and parents who are resisting reform efforts, boycotting testing, and fighting for holistic curricula. Music will become a central component in every child’s education if and only if public stakeholders push back hard against undemocratic corporations, politicians, and policies. Music educators must help other educators break free from narrow, ill-conceived concepts of education such as Common Core. Let’s join and support perceptive, courageous, and well-informed parents, teachers, testing experts, and scholars, and the Badass Teachers Association who have valid reasons for being anti-testing and anti-Common Core Standards; people like Fred Smith, a veteran testing expert who worked for the New York City Board of Education. Smith warns parents that Pearson will be administering field tests in the schools in June. He provides a list of schools where the field tests will be given. He urges parents to opt their children out of the field tests. The opt out movement is proving to be the most powerful tool that parents have against the whole agenda of test-and-punish “reform” that is being foisted on children and schools, benefiting no one but the testing industry. Sadly, the music education profession has a long and destructive history of jumping into bed with every new state and federal “educational” policy that comes down the road (e.g., NCLB, Common Core)—without first analyzing and anticipating the potentially harmful consequences these policies will have for music education. Too many music education advocates are obedient followers, not reflective and wise leaders. NCLB didn’t result in the addition of more and better school music programs, and neither will Common Core. So, why is NAfME supporting Common Core? It might make some sense in the immediate political environment, but not in any truly educational sense. “After nearly 20 years of reading, observing, teaching and presiding over a school, I’m convinced of this simple statement: ‘Measure the wrong things and you’ll get the wrong behaviors’ is at the root of what ails education, from cradle to grave. “Measuring the wrong thing (standardized scores of 4th graders) drives the wrong behaviors (lots of test prep and dull direct instruction). In later school years, measuring the wrong thing (SAT and other standardized test scores, grade point averages, class rank) continues to invite the wrong behaviors (gaming the system, too much unnecessary homework, suppression of curiosity, risk-aversion, high stress). If we don’t think about it much, there’s nothing wrong with being held “accountable” for what we do as music educators. But what happens when we think carefully about the meanings and implications of the word “accountable”? When music educators have a moment to think about it—while being pressured by Common Core Standards to spend less time teaching music and more time prepping their music students for math and reading tests—they understand clearly that being accountable means being “answerable” for what their students achieve musically, but more and more importantly today, what their students achieve on high-stakes tests. Like all other teachers, they understand that “account-able” is related to “computare,” meaning “calculate.”……. Which brings us to the obvious but frequently overlooked fact that accountability entered the educational lexicon largely by way of business. Here’s one more way that words matter. Notice that calling a policy change a “reform” movement effectively hides “a wolf in a sheep’s clothing” and, thereby, dupes the public into thinking that so-called “Common” Core Standards are a good thing for children—”Hey folks, Common Core is just common sense!” As Launce Rake explains, “if you want to take apart the teachers unions and make it easier to fire teachers, don’t say ‘make it easier to fire teachers. '” Call it “education reform.” If you want to make music a serious school subject, “reform” music education—that is, force music teachers to spend more time on academic test prep and less time on music. “Responsibility” has some things in common with “accountability.” Responsibility also asks people to be “answerable,” but in the very different sense of being “reliable and trustworthy.” “Response-ability” is a personal and ethical disposition, it’s a matter of personal and ethical integrity, it’s a quality of mind and heart. As opposed to account-ability—i.e., knowing how to test and calculate students and teachers according to top-down Standards and tests imposed by policymakers and education publishing corporations—responsibility goes to the heart of what teaching and learning are all about: human relationships in situ. When we’re held accountable, we’re unable to empower our students to achieve the values at the heart of musical participation: communal joy, intersubjective fellowship, collaborative artistic expression, creative musical generation and selection, deep and transformative musical-emotional experiences, and all other dimensions of what Aristotle—who emphasized the necessity of music education—called eudaimonia, or a life well lived. When we’re responsible music teachers, we’re concerned with providing our students with the musical skills and understandings they desire and need for life-long musical particip-action. When we’re responsible music teachers, we aim to foster understanding and respect for others and others’ musics and, thus, mutual respect among the students in our care. When we’re responsible music teachers, we provide instruction that’s intimately tied to the formative assessments we make during, after, and beyond musical instruction. While we agree with this author in many ways, may we respectfully suggest that the arts, physical education, etc, should not merely be “extracurricular.” They should be a regular part of daily school life for all children. This was the case until NCLB and Common Core were born and enforced. Because of their narrow concern for testing math and literacy, schools, through misguided polices, have made the arts and other “soft” programs inaccessible for millions of students. And they have led to the termination of hundreds of school music, visual arts, and physical education teachers. Cost-cutting is what these policies are really about, not education. If we’re supposed to be living in a democracy, which includes equal educational opportunities–through public education–for all children, then the idea of “extracurricular” programs for a limited number of kids is fundamentally undemocratic, no? It astonishes us that United States policymakers fail to grasp the obvious: ALL students in this democracy deserve and would benefit in many ways from equal access to balanced school curricula for the whole child, which includes equal access to physical education, arts education (etc.) during school hours (not simply after school). And here’s a related issue. Try learning to play or sing music expressively, or learning the techniques and strategies of basketball. We’re not talking about becoming a pro. We’re talking about becoming a competent music maker, etc. If administrators and policymakers actually did these things, they’d quickly realize that learning to make music or play basketball reasonably well requires much more than simple, “soft” skills and understandings. Such pursuits are appropriately challenging, creative, rewarding, and provide significant “life vales.” There’s a growing body of research that supports the conclusion that learning so-called extracurricular subjects is very effective in empowering kids to make a life as well as a living. And now ask yourself this: Does it make sense to assume or assert that education means doing little more in school all day, every day, than study math and reading in preparation for standardized tests? The surprising thing about U.S. schooling today is not that so many kids leave school as soon as possible; the very surprising thing is that more kids don’t leave the highly restricted and humanistically impoverished environments of many schools. Music = ax2 + bx + c. Huh? 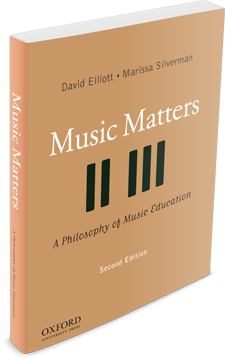 If you’re tempted to believe all the hype about how music education definitely, actually, absolutely increases the likelihood that students will achieve higher scores on standardized tests of math and reading, consider three counter arguments by top scholars who’ve spent their long careers researching relationships between music education and achievement scores: Dr. Ellen Winner, Dr. Glenn Schellenberg, and Dr. Eugenia Costa-Giomi. It follows that any claims we read about music improving any specific dimension of cognitive functioning are premature at best, and invalid and unreliable at worst. Let’s take a moment now to put these points in the broader context of American educational and political policymaking. This past summer, the eminent NYU educational scholar Diane Ravitch wrote: “I don’t know about you, but I am sick of the test score obsession. I think our schools need to have a prolonged testing moratorium so we can figure out what education should be about and how to reduce our dependence on testing.” We couldn’t agree more. And we’re very concerned about what today’s testing obsession—and music advocates’ manic drive to link music and academic test scores—has done and is doing to music education. For example, as we write this post, many music teachers in our hometown of New York City are preparing their math lessons. Wait, what was that? Yes. In a growing number of public schools in NYC (and in other places across the U.S.), music teachers are being told to set aside a considerable amount of time in their music classes—including their band, choral, general music, pop music, and other music classes—to teach math and literacy skills. In addition, many music teachers are being notified that a percentage of their evaluations will be based on their students’ standardized test scores in math and literacy. And this trend is currently moving upward in the form of “report cards for teacher education programs,” as Dr. Anne Whitney explains. Which brings us to the first of two takeaway messages: Be Very Careful What You Wish For! Why? Because the more administrators and policymakers are persuaded that “music makes you smarter” and that “music raises math and literacy scores” (etc. ), the faster music students and music teachers will be evaluated NOT on their musical achievements, but on students’ math, reading, and other achievement scores. One of the engines powering this obsession is called the Common Core or the Common Core State Standards Initiative. The Common Core is a recent U.S. school “reform” initiative that outlines quantifiable benchmarks in English-language arts and mathematics at each grade level from kindergarten through high school. On the surface, it seems reasonable and necessary. But, look more carefully—go below the surface of official U.S. documents and uninformed journalism—and you’ll see that this policy is deeply flawed. Why and how? Ravitch, other scholars, and thousands of teachers provide detailed explanations of how the Common Core is reeking havoc on many aspects of education in the United States—and why it’s becoming a serious threat to music education. For constant updates, see Diane Ravitch’s blog and read her book: Reign of Error: The Hoax of the Privatization Movement and the Danger to America’s Schools. Know, also, that Ravitch values the importance of music making as an aim of schooling. In fact, she once said to David in person that she wished all teachers would teach as effectively, educatively, and joyously as the best music teachers she’s seen. Books and blogs by Ravitch, Michael Apple, Alfie Kohn, and many likeminded scholars and parents explain why NAfME’s well-intentioned support of the Common Core is highly problematic—NAfME’s adoption is politically correct, but it’s educationally injurious nevertheless, as was MENC’s quick and uncritical adoption of NCLB in the 1990s. Time for a reality check: Is it fair to say that music teachers are and should be primarily educated to teach music? Is it true that most music teachers are not fully (or even partially) educated or certified to teach math or literacy? Is it right to say that it takes a considerable amount of skill and content knowledge to teach math and literacy well? If so, why not leave the teaching of math and literacy to math and literacy teachers? We’re not saying that music students should not engage in cross-curricular experiences if/when appropriate. But this is for each music educator to determine in his/her class. One last point—a second take-away message. What few people realize is that the Common Core movement, and Bill Gates’s initiatives, are powered by a socially and educationally damaging economic-political movement called neoliberalism. Among other things, neoliberalism aims to privatize all areas of social life, including education. Today, education is “Big Business”—education is not about education in the deep sense, it’s about preparing “job-fillers,” not well-rounded citizens—as the eminent critical pedagogue and cultural critic Henry Giroux explains in his commentary on education, social justice, and neoliberalism. In short, the Common Core is the tip of a very ugly economic-political iceberg. Given today’s corporate, Wall Street priorities, many politicians and policymakers fail to value music education because learning how to make and appreciate music and the other arts is not immediately “profitable,” meaning that music is not directly related to preparing kids for jobs, and money-making, and future consuming. Here’s another reason why many advocates and teachers are knocking themselves out trying to explain why music education improves math and reading and why some advocacy “stuff” tries to persuade parents that if their children participate in music, they’ll make higher salaries as adults. What does all of this mean for students? It means the steady erosion and elimination of meaningful school music programs, musical experiences, and the end of many music teachers’ careers.